Noah in his MyStroller adaptive stroller. Overabundance is an issue most charitable organizations would like to have. It’s an unusual predicament, but Variety the Children’s Charity finds itself in just that position. The group, which gives adaptive bikes, strollers and communication devices to children with disabilities, has 200 devices to give out – but as of Thursday, only 50 had been claimed. “These are very fundamental to daily living for kids with disabilities,” said Variety CEO Charlie LaVallee. Variety received a grant from the Jack Buncher Foundation along with a matching grant, totaling $275,000. 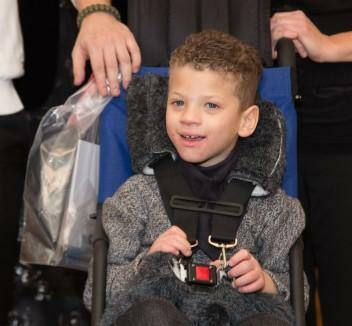 LaVallee said that means the organization has the ability to give out 200 adaptive strollers or communication devices, but three-quarters are still available. “Communication is essential to living,” said LaVallee. And for some children, that communication is possible through MyVoice. It equips children with communication disorders with an iPad tailored to their needs. The device allows them to communicate at home, school and in public. A family can apply for the device and after consultation with family, teachers, therapists or other people close to the child, can install the appropriate communications app – often one that matches what the child is already using at school. Also offered is MyStroller, an adaptive stroller that gives parents and caregivers more access and mobility than a wheelchair might in some cases. Families can apply for MyVoice or MyStroller through Variety’s website. Friday marks the public kickoff for a new program assisting children with communication disorders in Western Pennsylvania. Variety the Children’s Charity’s “My Voice” program will select up to 20 children to receive iPads with apps specifically tailored to their needs as prescribed by their individual speech language pathologists.